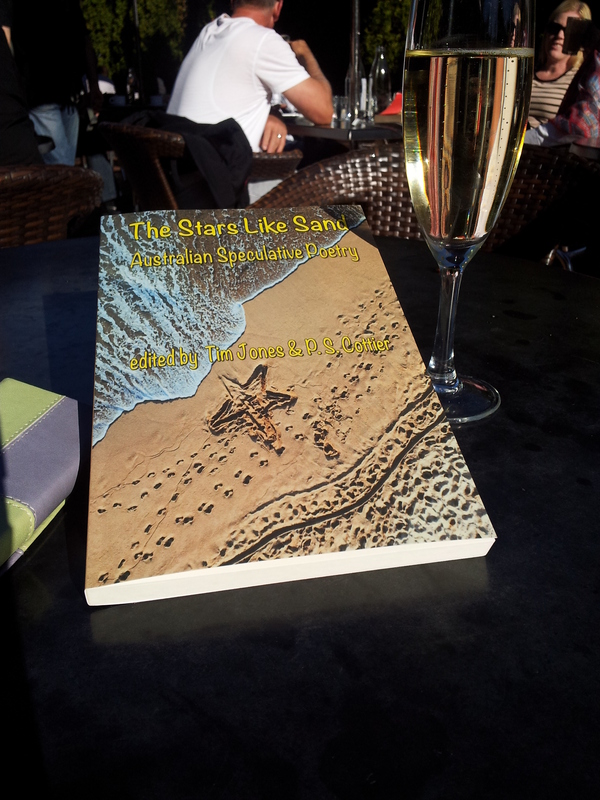 Last Thursday the second launch of The Stars Like Sand occurred in Canberra. 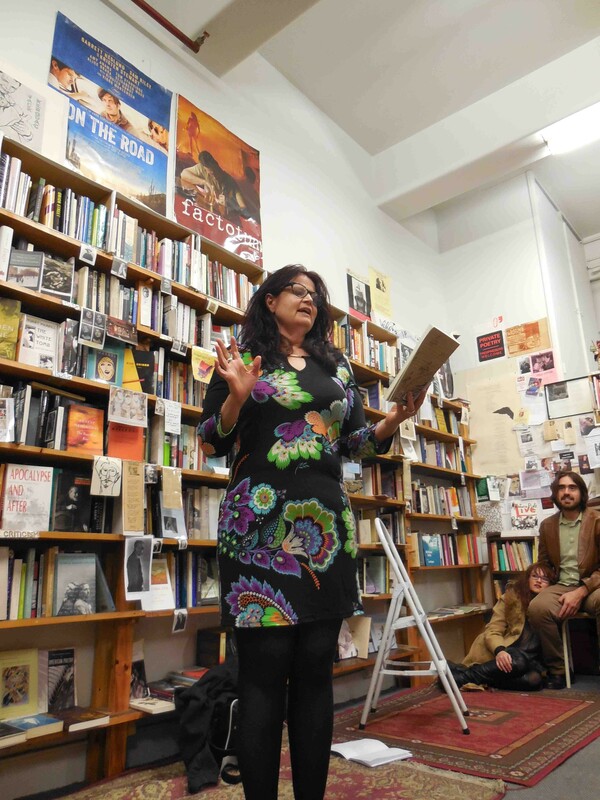 Novelist Kaaron Warren, pictured here, did the honours, and spoke of her love of poetry, despite not writing it herself. 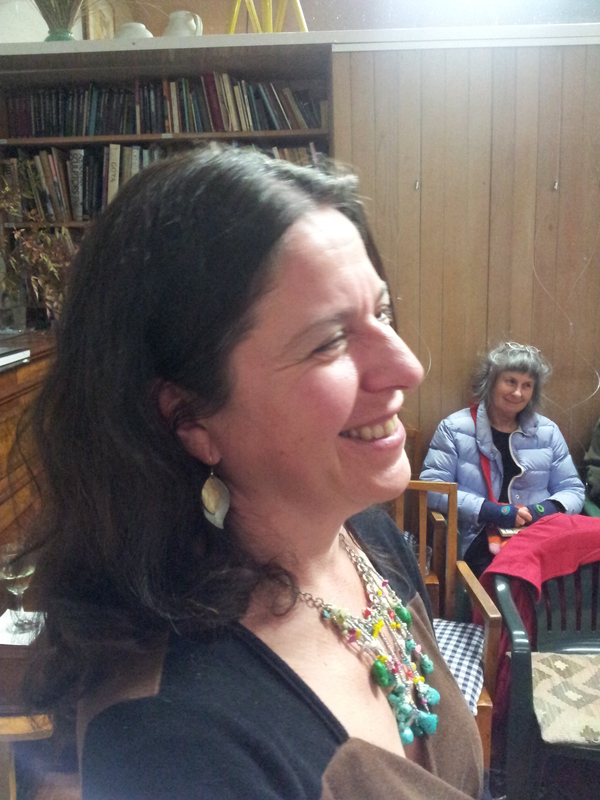 She compared it to those without the skill watching someone crochet or knit, and distributed woollen bookmarks. Another ten poets read, and they read beautifully. Alternative pedigrees. Different ways of being. Garments we put on. The sinuous muscles of poetry. Lines of knitting. Each launcher took a different direction to describing a book that tries on different worlds. I am in a state of mild grief now as the book that was once a near endless possibility, is now a thing; a physical object that has its own place in the world. It is what it is (subject to interpretation) and it is no longer mine. What once existed into multifarious complexity is now rendered actual. That’s always a bit of a bummer, even if it’s also a delight. It’s a bit like the difference between hearing a joke told for the first time, and hearing the same joke again. Something is lost, isn’t it. Something that leaps in the mind and the body at exactly the same moment. But what a misery guts I am being; mulling over mental gruel rather than Pantagruelling! I should be revelling in the joy and enjoying myself! It is, I think, in many ways, a wonderful book. But it seems that some of us are more attuned to loss than achievement…even if we like funny poems. I certainly enjoyed meeting my co-editor Tim Jones for the second time, as opposed through working through the aerial guts of Skype, with its weekly digital farts. Here is a photograph of Tim listening. He is much better at that than I am. He is listening to the wonderful Joe Dolce read his poem at the Melbourne launch. 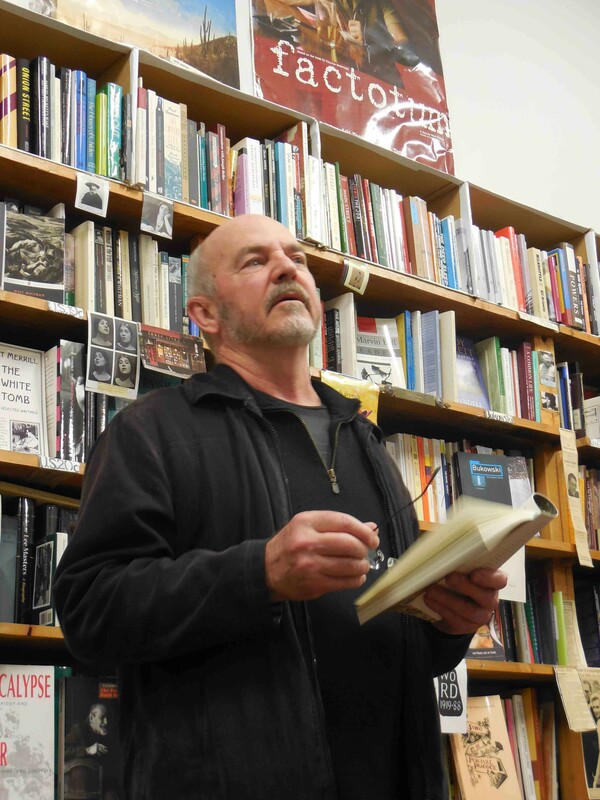 Tim has a new post about the Canberra launch too, at his blog. We have forwarded the list of poets’ addresses to the publisher, so all contributors should receive their copy soon. Thank you to all the poets who contributed, and also to our two wonderful launchers. Now I am going to revel in The World Cup for a month. In another universe, Australia will be winning. *Spellcheck kept trying to render ‘pataphysics as pasta physics, by the way. Love those alimentary lineaments. 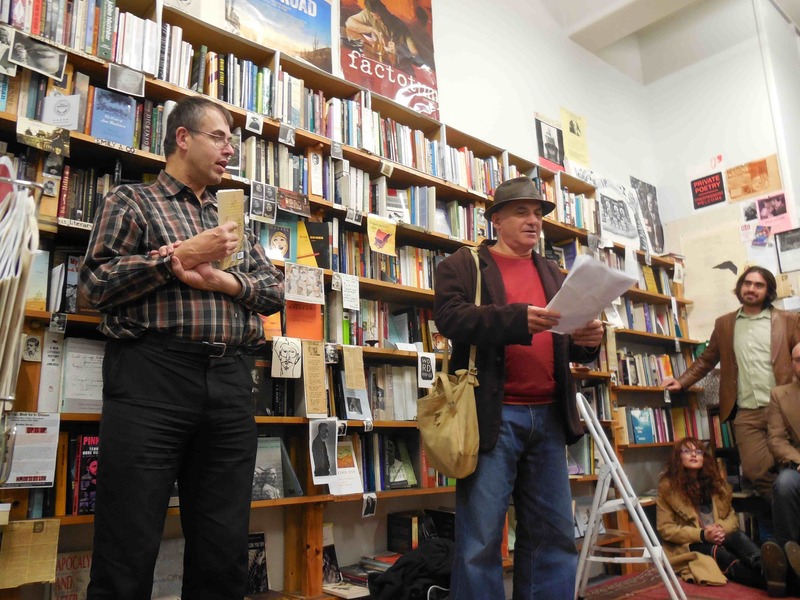 Here is an image of Earl Livings reading his poem at the Melbourne launch of The Stars Like Sand: Australian Speculative Poetry. Thanks to Breanne Rodda from Interactive Publications for this photograph. I’ll be posting more images shortly. 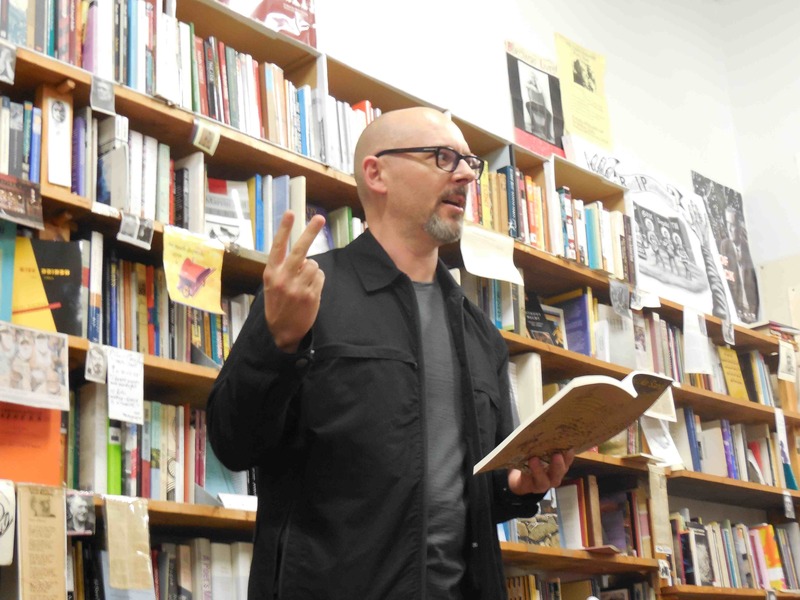 Philip Salom launched the book at Collected Works, and about ten poets read. Tomorrow is the Canberra launch, and after that, I’ll have a lengthier post about the launches. I’m looking forward to hearing what Kaaron Warren has to say. My fellow editor, Tim Jones, is in Australia and has been cruelly attacked by kangaroo poo down on the south coast of NSW. I was not worried by the marsupial droppings, which obviously target visitors from New Zealand. Tim’s blog also has a brief piece on the first launch. I am looking forward to the launch tomorrow, and to hearing more of the poems brought to life. We’ll be distributing contributors’ copies at the launch, and copies will be sent to other contributors after that. You can buy copies from the publisher or from Amazon. Sean Williams is counting to three here. Honestly. Cradled in my pod, my body shut up like a bedside book, with a bookmark of drugs inserted to continue me some day, I had a nightmare. It was an old fear for the fourth millennium, that of being buried alive. And it came to whisper panic in my ear; you are forgotten. They have entombed you in speed. No-one will be there, at journey’s end, to dig you out, little podded pea. Fool, to accept this alien life, to dream in airless space, a ghost not dead, a man suspended beyond hope. Hanging in time, rope of frayed expectations slipped around your neck, tightening. And still you fly stupefied, dumb, trusting those not yet born to release you. Listen to your heart beat the retreat, a jerking jazz rhythm of fear. The living dead, that shady cast of zombie, of vampire, flickered like ancient film shadows through my mind, a hazy cloud of horror where no cloud ever forms, out here between one star and the next. Feeble belief of resurrection somewhere, beyond the years. Sleep left me. Gulping, choking, drowning in doubt, my eyes scanned the dark inside of the pod, looking for escape, for any feature to tell me that I was, in fact, awake. That I was, in fact, alive. But the pod was like a closed eye, and I was trapped inside its blindness. How could I know? Was this lulling pod a grave? I fought to feel the walls of the capsule, read their enclosing story in Braille, but my arms were pinioned, would not shift. 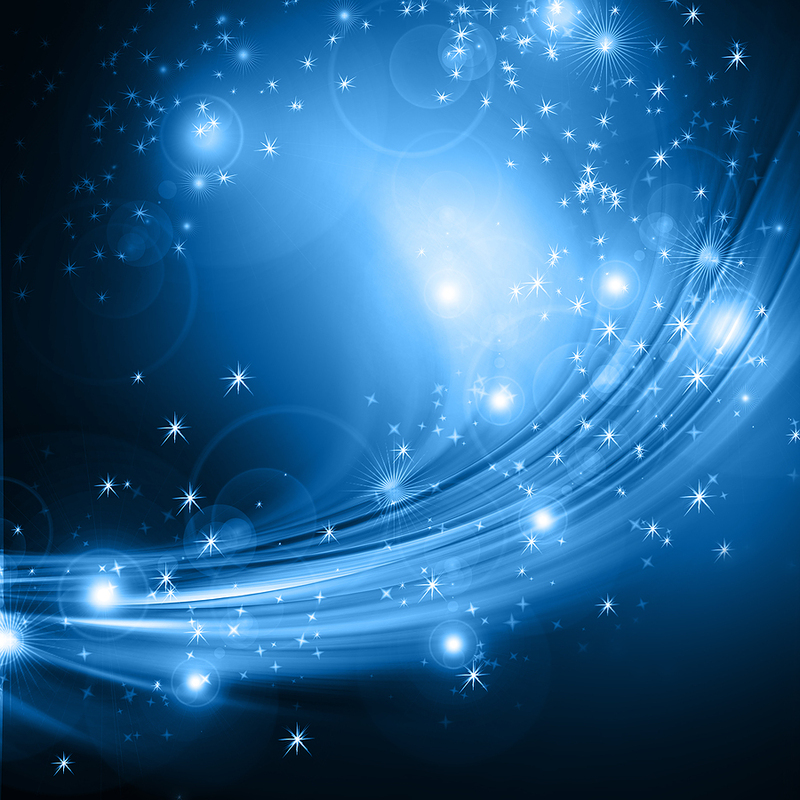 I was wrapped in spider’s silk, a stupefied unbreakable embrace. My disquiet lead me further inside myself, with no twine of reason to bring me out. Knotted in a strait-jacket, tangled in progress, I sped on into darkness. Machines detected, read the chemicals, adjusted. Put me back to sleep, rocked a thousand years. But now I dream only of death, and the heavy years and the speed of light smother me. I staked my life on stability, that there will be no upheaval in which I will be swept away, an insect unmourned, amongst the crumbs of swarming stars. I am the unborn, dreaming in the womb, this metal womb, quickening towards my second birth, but bracketed in iron ifs and buts. Icarus with untried wings of steel. Hiatus, hubris and hell here, inside me, inside the pod, cast away. I wrote that piece of prose/prose poem for a competition in the United States way back in 2008. I was lucky enough to win, and actually went to the convention which had organised the competition in Wisconsin. (The Odyssey Convention.) This was a turning point in my writing, and although I had been exploring the speculative in my work, it certainly helped to strengthen that element. Since then, ‘Pod, cast’ was republished in the Indigo Book of Australian Prose Poems, edited by Michael Byrne. Currently, I have a poem up at Eye to the Telescope, the online journal of the Science Fiction Poetry Association based in the United States. This one is edited by Robert Dutcher, and is one the interesting topic of ‘mundane’ science fiction, that is, the idea that we are basically stuck in our solar system with no aliens and no journeys to other galaxies, as undertaken by a million travellers in a million science fiction novels and films. And by my nameless traveller in the prose poem above. 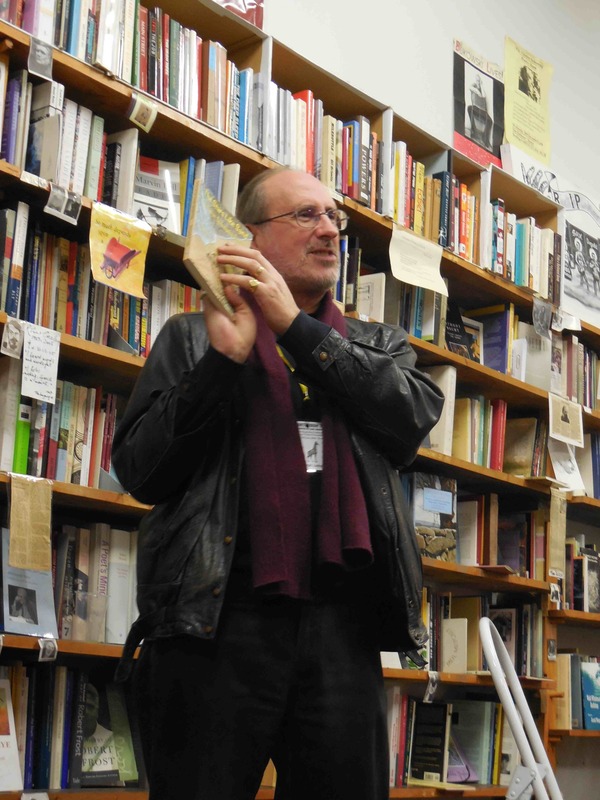 Melbourne, 6pm for a 6.30pm start, Friday 6th June, Collected Works Bookshop, 1/37 Swanston St, Melbourne. To be launched by renowned poet Philip Salom. This is to be a joint launch with Gemma White’s new collection, which is also being published by IP. Canberra 6.30 for a 7pm start on Thursday 12th June at Manning Clark House, 11 Tasmania Circle, Forrest, ACT 2603. To be launched by the multi-award winning novelist Kaaron Warren. There has been a wonderful response from poets to our request that they read poems from the anthology at the launches. I am looking forward to the two launches so much. Anyone reading this is most welcome to attend. I’ll post the proper invitations here, and of course, sent them out (by email) to lotsa persons.